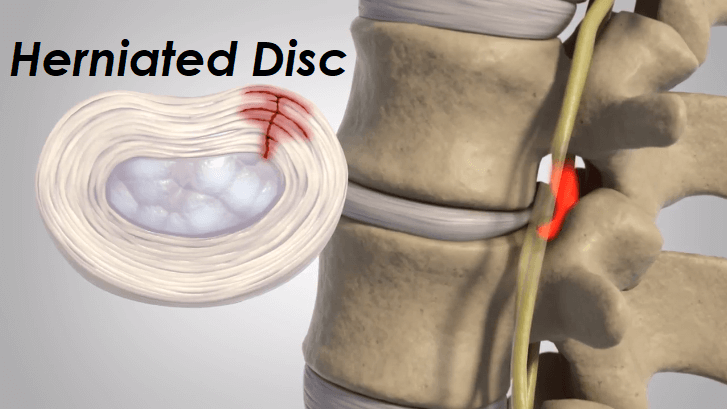 What exactly is a herniated disc ? By admin , in Herniated Disc on January 16, 2019 . A herniated disc is a common medical condition that is affecting the vertebral column. A lot of people that are constantly experiencing back pain, and in certain cases leg pain, can be diagnosed with this condition. When a herniated disc occurs, then a tear in the fibrous ring of an inter-vertebral disc allows its central portion to stick out in a rounded shape. Even thought this condition is rather painful and can drastically affect the life of the one who suffers from it, such as causing him tremendous pain when walking and even sometimes making him completely unable to work, it usually is treated within six weeks, and without the need of a surgical intervention. A more in depth look at this condition follows. Sitting between each vertebrae of the vertebral column, the spinal disc is a cushion that gradually becomes stiffer with the advancement in age. In young people the spinal disc is very elastic, reducing significantly the risk of an injury. The point when the spinal disc begins to severely lose its softness and elasticity is around 40 years for most people, yet in some cases people that have not yet reached 30 years can already face this deterioration process. This is not something that can be avoided, however, some studies have shown that in people that tend to have an active life and that practice sports regularly the spinal disc can take longer before it actually begins to deteriorate. Obviously, the chance of a spinal disc suffering from a rupture gets higher and higher with age, as it loses its elasticity. When this happens, a small portion of the spinal disc pushes outside its usual boundary. 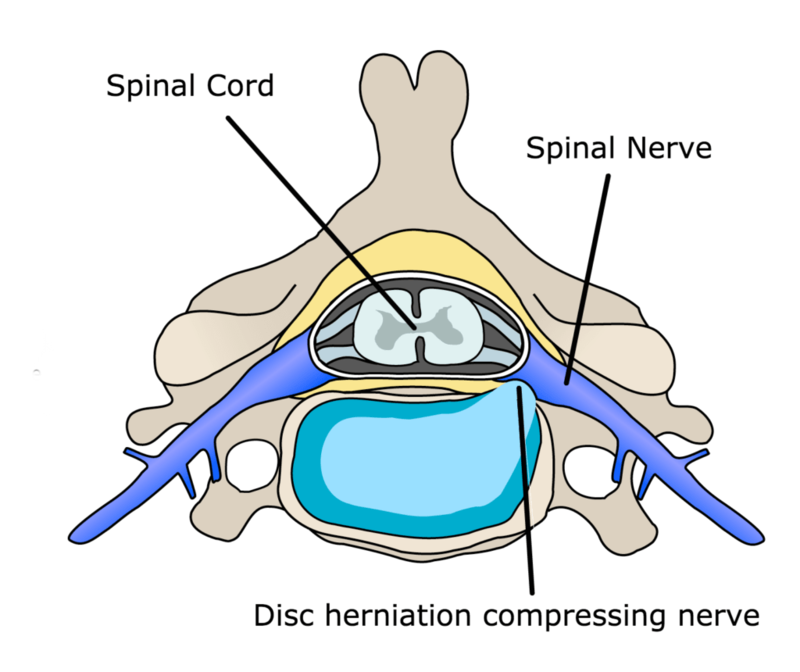 This leads to the spinal nerves and to the spinal cord to be compressed, as the herniated disc is moved from its usual space, pushing their structure. In most cases this unpleasant medical condition can appear after a bad fall or after any other severe shock that might affect the back. Besides this sudden way of ´acquiring´ a herniated disc, individuals that tend to constantly strain their spinal column can often suffer from this condition. In their case the pain might not be as sudden, and it can develop over a period of time, becoming more and more pronounced gradually. Essential in their case is to stop straining their spinal column further, otherwise their condition might become more severe, with long lasting complications. As spinal nerves become compressed, their functions are altered. They can then send abnormal signals or sometimes, send nothing at all. Here are some of the common symptoms associated with a herniated disc. A general weakness of the muscles: This occurs as the nerve irritation can cause the signals from the brain not to reach their intended target. This is a usual symptom that many people do not associate with a herniated disc, simply considering that it is all because they have worked too much lately. If that is the case, then the weakness of the muscles will pass in a few days, if not, then it might be because of a herniated disc. A simple and effective way to test this is by carefully examining your reflexes. Shock pain: Resulting because of the pressure on the nerves, shock pain is often associated with a herniated disc. Depending on the area of the damage, the pain might be mostly experience either in the legs or in the arms. Other strange sensations might be associated with this kind of pain. Numb muscles: When numbness occurs many people start to worry, thinking that perhaps they might be suffering from a very severe condition. Rarely that is the case. Muscle numbness for someone that has a herniated disc is a common symptom that can be felt generally either in the arms or in the legs. Bowel issues: When this symptom is associated with a herniated disc, then it is possible that the condition of the individual experiencing it is severe. This can lead to some other complications associated with a herniated disc that can have very dangerous consequences for the one suffering from them. The best advice in this case is to go and see a doctor as soon as possible. Even if a herniated disc is treatable, the best way to prevent it is by avoiding all those activities that can strain the spinal cord. The advancement in age will drastically increase the chances of suffering from this condition, and that is why even more prudence should be employed then. Constant physical activity, without exaggeration, is an excellent way to avoid a herniated disc and to generally get in a good shape that minimizes drastically the chance for developing further painful medical conditions. Herniated disc is a medical condition and by knowing how it affects the body you will be able to recognize it right away if you ever suffer from it. The following article may be helpful for additional information.